All of particle physics rests on a theory known as the Standard Model, which lays out the fundamental particles that exist in nature, as well as the forces that govern them. The Standard Model includes two main families of particles: fermions, which include all the constituents of matter, and bosons, which include all the known force-carrying particles. Fermions come in three generations of progressively greater mass. Click below to learn more about each particle in the Standard Model. 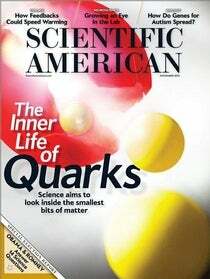 For more on Standard Model of particle physics, read the "Inner Life of Quarks" in the November 2012 issue of Scientific American.